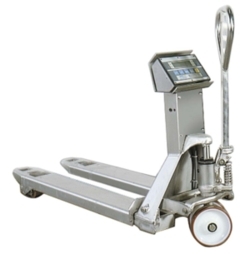 High quality, stainless steel pallet truck with built in weighing facility. Truck and display unit are IP65 rated; giving total protection against dust ingress and protection from low pressure water jets from any direction. As standard, a standby cut out is included to prolong battery life. 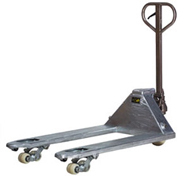 The TP-X and TPE-X highlifters are designed to lift a pallet or stillage to a comfortable working height to reduce repetitive bending and stretching. 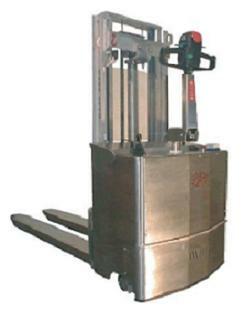 Lifting is either manual hydraulic or by battery-electric pump. Manufactured from 100% 304 grade stainless steel, ideal for use in food, chemical and pharmaceuticals industries. The electric version truck is protected to IP54 so can be hose washed, the manual machine can be power-washed. Single ram pump design—stronger and more reliable than telescopic rams used on many other trucks. Also available in other fork width 685 mm and fork lengths of up to 2000 mm. 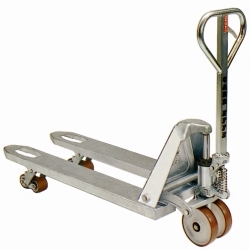 The TEX16 powered pallet truck is the ideal truck for use in the most inhospitable of environments. Manufactured from 100% 304 grade stainless steel, it is ideal for use in food, chemical and pharmaceuticals industries. 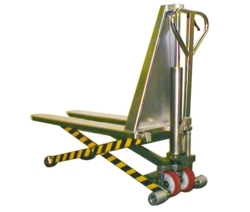 The WARRIOR galvanised pallet truck is suitable for usage in cold stores, clean rooms and corrosive environments. 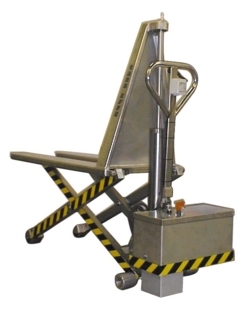 The WARRIOR Stainless Pallet Truck is a full stainless steel Pump Truck suitable for use in a host of specialist applications such as corrosive atmospheres, pharmaceuticals, food hygiene areas, saline and many other aggressive environments.